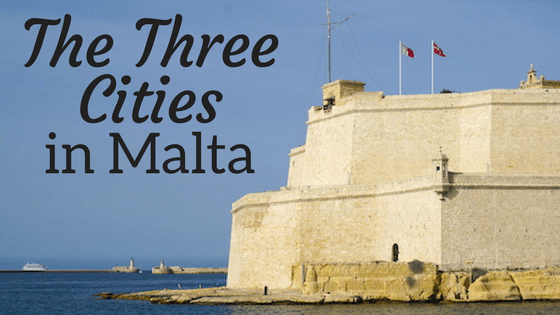 On the other side of the Grand Harbour from Valletta, you’ll find an area called the Three Cities. Their history goes back to Phoenician times – the area has always been a popular maritime community. But even if you’re not a history buff, at least make a quick visit to the Three Cities in Malta to explore the meticulously kept traditional neighborhoods and to marvel at the superyachts gracing the marina. The view of Fort St. Angelo in Birgu/Vittoriosa from across the Grand Harbour in Valletta. These so-called Three Cities are individually called Birgu (Vittoriosa), Isla (Senglea) and Bormla (Cospicua). The reason for each of those names in parentheses indicates the layers of history here. Birgu, Isla, and Bormla were the original names of the cities before the Order of St. John came to Malta in the 1500s. After successfully surviving the Great Siege of Malta in 1565, the Order of St. John dubbed Birgu La Citta Vittoriosa – the Victorious City. Today, both Birgu and Vittoriosa are used for this section of the Three Cities. On the peninsula called Isla, the city of Senglea was built and Senglea seems to be the more common name used today. Cospicua (used interchangeably with Bormla) is the inner part of the harbor stretching back up to the old defense walls, known as the Cottonera Lines. Those Cottonera Lines were built in the 1600s to protect the area from land attacks since attacks by sea were already difficult against such a heavily fortified area. The Three Cities often include a fourth city into their mix: Kalkara. Kalkara is the peninsula where the Esplora Interactive Science Center and the old Royal Naval Hospital are located. That’s the peninsula on the left as you’re looking across the Grand Harbour from Valletta. These Three Cities predate the capital of Valletta, yet they aren’t visited nearly as often by tourists. That means that the tourists who do visit are rewarded with an even better glimpse into local life in Malta. Of course, with the depth of history in such a small space, a brief visit to the Three Cities in Malta merely scratches the surface. But it’s a start nonetheless! In only a few hours, I suggest you simply wander. You could opt to spend your time inside the museums and forts to learn more about the history of the area. But, personally, unless the weather is bad (which is rare in Malta), I would much rather wander a neighborhood and chat with locals to get a feel for the present. You can always research online to learn more in-depth at another time. But being there to appreciate the traditional architecture of local homes, the brightly painted shutters and front doors, the hilly streets winding their way around the peninsulas…that’s the beauty of travel. Once you disembark from either the ferry or the water taxi from Valletta, head left along the Vittoriosa Waterfront. The harbor is filled with some of the most prestigious yachts in the Mediterranean, so a new waterfront area with restaurants and wine bars has grown in recent years. Once you reach Fort St. Angelo, you can walk through the parking lot to find a staircase along the side of the fort. Take that to reach the actual end of the peninsula for lovely views of Valletta across the Grand Harbour. It’s also a nice little swimming spot away from the crowds if you want to jump in for a quick dip. Just don’t swim out into the middle of the harbor – the boat traffic is constant. The old town of Birgu is fascinating to explore. Wander these narrow streets and enjoy the obvious care residents take to keep their neighborhood vibrant and beautiful. There are several historic churches in Vittoriosa (see how I keep switching up the names? Now you know how we felt when locals did it to us!) if you’d like to explore those, and I’m told the festas here are some of the best on the island. I’ll have to see for myself! One thing I’d love to check out someday is the Rolling Geeks tour based out of Birgu. We saw their office on the waterfront and then encountered a few carts along our wandering path. These electric, covered golf carts offer a unique way to explore extensive ground in all four areas, Kalkara included. I’ll be sure to let you know if I get to do one of their tours! But in the meantime, simply wandering these streets, pausing to pat the local felines and to take in the beautiful views, was a wonderful way to spend an afternoon. The marina is a feast for the eyes and we thoroughly enjoyed scoping out the variety of sailboats and yachts. The white and red ferry you see behind the sailboats runs back and forth to Valletta constantly. Crossing the pedestrian bridge toward Senglea, we opted to just wander up into Cospicua, rather than heading to the end of the peninsula. That will have to be for another day as I’m told the views are gorgeous from there as well. The hills of Cospicua were no joke, but I really enjoyed the diversity of topography and seeing how local residents created a community working with the land, rather than trying to mold it to their whims. This zig-zag ramp shows the incredible height difference between streets – with buildings constructed despite that gap. Street level on one side of the building is the fifth floor from the other side! After several hours of wandering around, a lovely lunch in Birgu, and taking endless photos of these beautiful Three Cities, we headed back to Valletta on the ferry to make the journey home. Until next time, Three Cities! I’m sure you’ll see me again several times. Buses from Valletta are an option to reach the Three Cities, but there’s no better way than to take a water taxi across the Grand Harbour. The water taxis are traditional Maltese boats, seen here in comparison to a cruise ship docked at Valletta. To find the ferry dock and water taxi departure point, you can take the elevator from the Upper Barrakka Gardens in Valletta. It will bring you down to street level below – take a left and you’ll see an entrance on your right to reach the water. The water taxis leave from right there, while the ferry departure is just around that building. You’ll see a few benches under a canopy for shade at the ferry departure point. If you take a bus to Valletta and want to head directly over to the Three Cities, get off at the bus terminus and walk across the street toward the water. Take a right along that wall with the garden areas and you’ll come upon a long staircase on your left. That brings you down to street level; just go left at the bottom of the stairs past the cruise ship area and you’ll come upon the departure points eventually on your right. The ferry costs €1.50 each way while the water taxi is €2. Go for the water taxi at least one way for a beautiful ride across the harbor. We recently moved to Malta as the latest stop in our expat adventure. You can read more about Malta here, about our expat lives in Roatan here, or about our other expat adventures in Scotland and Ireland. Keep up with me via random newsletters by filling in the subscription box below. And I’m on Facebook, Instagram, Twitter, and Pinterest so let’s be friends!